Our Flat shaped Bellows are widely used in different industrial applications to ensure hassle-free performance for longer term. We are reckoned as the trustworthy Flat Bellows Manufacturer, Exporter and Supplier. Flat Bellows that we offer are made from superior grade raw materials and accredited for high strength, durability, excellent finish and accurate dimensions. 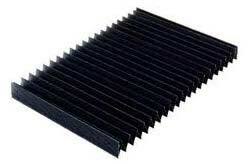 Bulk quantities of Flat Bellows can be obtained from us at reasonable price.